We found this recipe through one of Gordon Ramsay recipe but we slightly change a bit here and there. We follow exactly how he prepared and marinate his prawn but we add in long beans and water to add some gravy in it. I'm not fond to Gordon Ramsay because he likes to curse a lot! Its like watching a cursing show instead of cooking show but on the other side my dear husband like him very much. He collected all his recipe books! After reading his recipe books, I loved his recipes! Its simple most of the time. 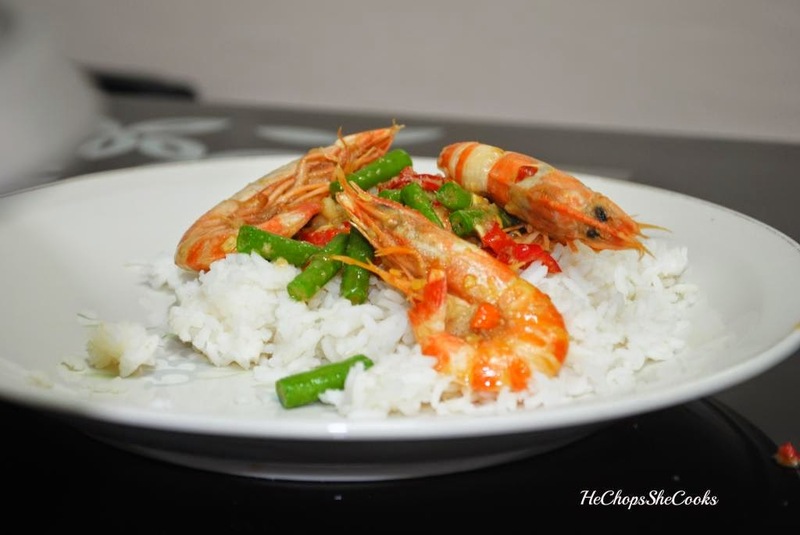 1.Put the tiger prawns in a shallow dish. 2.Pound the garlic, chillies, lemongrass and ginger together using a pestle and mortar, gradually adding the olive oil until you have a rough paste (or whiz briefly in the blender). 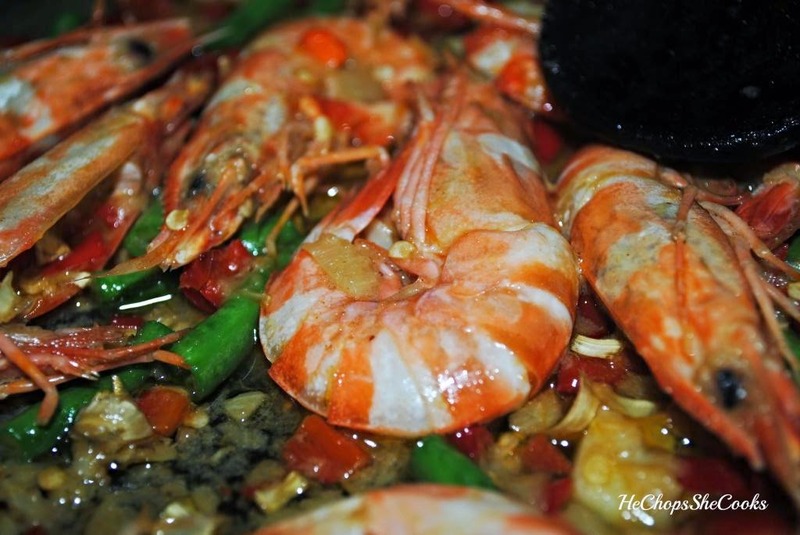 3.Season with salt and pepper.Baste the prawns with the spice paste and leave to marinate in a cool place for 2-3 hours. 4.Add in the olive oil and chopped onion, stir it until you can get the fragrant smells from the onion. 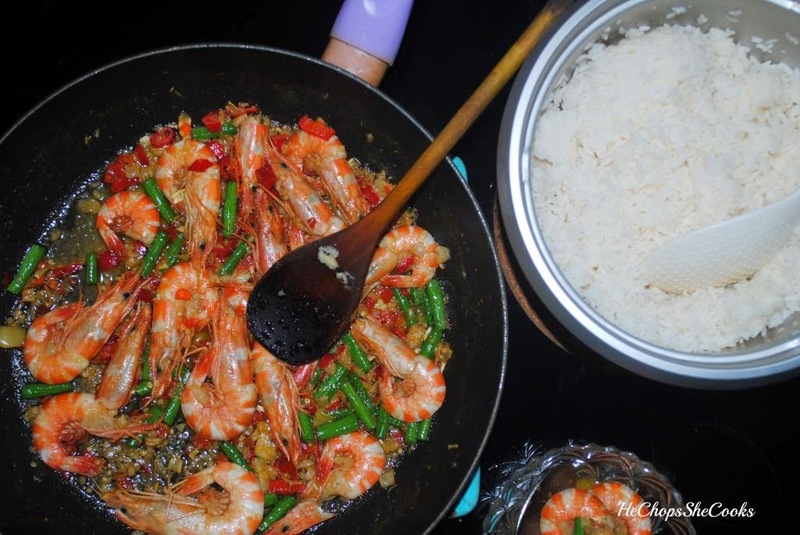 Add in the french beans and marinated prawn in the pan and cook them gently and well combined with the flavors. Lastly add in the water to bring out some gravy in the dish. Serve with warm rice.